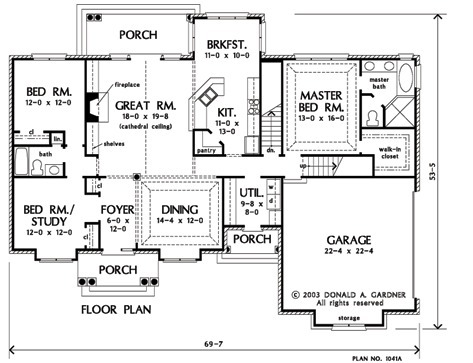 A service entrance accesses the utility/mud room, and a cupola dresses up the side-entry garage. A walk-in pantry, built-in cabinetry and coat closet add convenience, while ceiling treatments such as a tray in the dining room and cathedral in the great room create volume. The bonus room awaits expansion needs. 1st Floor: 2011 Sq. Ft. 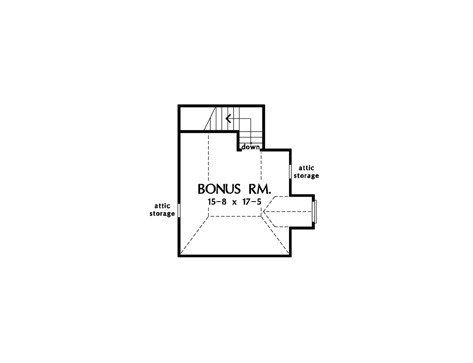 Bonus Room: 288 Sq. 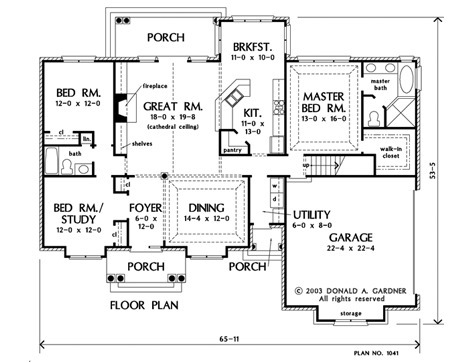 Ft.
House Dimensions: 65' 11" x 53' 5"
Bonus Room : 15' 8" x 17' 6" x 9' 0"
Garage : 22' 4" x 22' 4" x 0' 0"
Garage Storage : 11' 3" x 2' 6" x 0' 0"
Great Room (Cathedral): 18' 0" x 19' 8" x 19' 3"
Kitchen : 11' 0" x 13' 0" x 9' 0"
Porch - Rear : 17' 7" x 7' 0" x 9' 0"
Porch - Front : 13' 8" x 5' 7" x 10' 6"
Porch - Right : 5' 1" x 4' 0" x 9' 0"